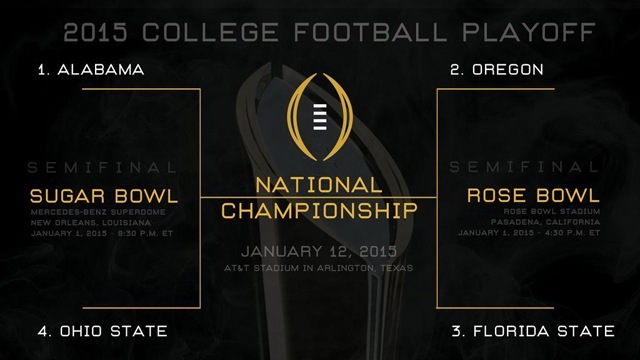 Who will win the inaugural CFP? Nick Saban has started beating that old death march of inevitability at Alabama again, and the Crimson Tide look every bit the unbeatable foe. At this point, any possibility of Alabama losing has to include a cartoonish slip-and-fall, crap-the-bed poor performance by Blake Sims. He appears to be Alabama’s only weak point. So I guess it’s more I can’t see Alabama losing than anything else. I mean, can you? But if there’s anyone who might befuddle Saban and his defense with unexplainable antics and under-duress improvisation akin to Johnny Manziel, it’d be Jameis Winston. Lane Kiffin will be the difference-maker in the national championship game. Alabama's offense can play with any team, and Kiffin -- given three weeks to prepare -- is just diabolical enough to game plan beyond what even Nick Saban and Kirby Smart will cook up defensively. Combined, that's a lethal dose of Southern fried football: new-skool, spread-the-wealth offense and old-school, smash-mouth defense. Ultimately, the Crimson Tide's defensive backfield will rise to the occasion and do enough to make the game-turning stop, which then will allow Kiffin to manage the game. Alabama can play point-for-point with Oregon -- and with a lead, Bama will control the clock enough to claim its third title in four years and fourth in six seasons. Alabama’s secondary has been its Achilles’ heel and Oregon’s Marcus Mariota will exploit that weakness if the two teams meet in the championship game. Auburn’s deep attack nearly folded the Crimson Tide last week, and I expect the Ducks to take plenty of downfield shots against the vulnerable DB unit. On the other side of the ball, Oregon’s defense will find ways to limit Cooper, arguably the best receiver in the country. Mariota will be the difference-maker in this contest and Oregon will return the national title to the Pac-12 for the first time since USC in 2004. The uniforms they wear will be undoubtedly hideous, but the Ducks play a pretty game of football. The leader of the pack throughout the entire college football season has been Oregon quarterback Marcus Mariota. Two interceptions in 372 passing attempts tells me this kid does not make mistakes. Oregon has a plus-17 turnover margin to Alabama’s minus-1 -- and I think mistakes will cost the Tide a championship. It’s not going to be easy for anyone to win the national title, but I can’t pick against Florida State until they lose. It’s so easy to look at the Seminoles’ struggles to win games in 2014, but they won all 13 games they played. The Noles find a way on offense and maybe more importantly, on defense, too. All FSU had to do was get into the tournament. They have an ‘it’ factor that you can’t teach and no team has been able to completely knock them out despite all of the struggles. That trend will continue in Pasadena and Arlington. We’ve seen the power of the SEC match up against the speed of the Pac-12 before, in 2010 when Auburn and Oregon met in the national title game. It makes for a fascinating matchup of Xs and Os, not to mention pitting the clear two best teams in the country against each another. And while Alabama likely would be the favorite in this potential title game, I’m going with the Ducks because of their craftiness in using speed to get into open space. Mark Helfrich knows how to get his guys to the edge and Bama will be extra concerned with keeping Marcus Mariota in the pocket -- and forcing the Ducks to cut upfield on the speed sweep instead of taking it to the sideline. That’ll leave Mariota and Co. with favorable matchups in the read-option game that could gash the Tide defense. Ohio State is clicking at the right time, and Urban Meyer has said without question this year's squad is the most improved team -- from start to finish -- he has ever coached. Despite injuries to key players and the tragic loss of a teammate, the Buckeyes pounded Wisconsin and its then-No. 2 ranked defense in the country in the Big Ten title game. Cardale Jones showed he could step in to replace J.T. Barrett and the offense did not miss a beat. Plus, the Sugar Bowl matchup is what every Buckeyes fan has wanted since Meyer was named head coach in 2012: a coach who earned his two national title rings in the SEC facing an elite SEC program. It’s finally the Ducks’ year. Heisman favorite Marcus Mariota is leading an offense that has averaged 48 points per game since its lone loss to Arizona on Oct. 2, and the defense hasn’t allowed more than 19 in the past three games. Alabama is good enough to get by Ohio State, but it doesn’t seem that anyone will be able to stop Oregon, a team that is third in the nation in both total and scoring offense. The Ducks won’t beat themselves, either, with a plus-17 turnover margin this season. Oregon is the best team left of both sides of the ball, and that’s why the first CFP champion will also be a first-time national champion.